The waiting was not only an imposition on the troops: it was not until 25th July that the British politicians offered their final support to Haig! And the waiting came to an end on a very damp morning at 3:50 a.m. on, Tuesday, July 31st. The British guns had been hammering the German lines for two weeks, firing over 4 million shells, and now the infantry went over the top on a twelve-mile front. Tanks were used both here and later but almost without exception sank or bogged into the August mud, which grew almost on a daily basis. On the afternoon of the first day it rained heavily, and the beeks began to rise, having lost their centuries old courses due to the incessant shelling. (I have walked in Passchendaele mud many times. It weighs mightily on your boots, sticks to everything and permeates your skin). It is evil. There had been some changes in the boundaries of the British Armies prior to this time redistributing the responsibilities of the generals. "Thruster" Gough was placed in charge of the main assault. "Daddy" Plumer who had controlled the Salient for many months was given a lesser role. Haig thought that Plumer's methods were not forceful enough for this breakout battle, whereas Gough's were. On the German side was General Sixt von Arnim who had lost the battle at Messines but was a clever and determined fighter. The battlefield is very roughly divided by the Menin Road running SW to NE. There was early success to the West but little to the East where the Germans manned extensive defences to guard against any further losses at Gheluvelt, facing Messines. In general terms, these were a multitude of concrete pill boxes, often sunk to ground level on reverse slopes and each covering several others with interlocking fields of fire. Some still exist in ruins, and the fields of fire they cover are mind-bending. To the attacking troops they were almost impossible to see, and it was necessary to design new tactics immediately to deal with them. A frontal attack was impossible so it was necessary to approach from the sides or, preferably, the rear. But these methods could easily be negated by incoming crossfire from other pill boxes. The problem was obvious, the answer unknown. Flamethrowers were not in common use, a smoke barrage was generally unheard of when attacking a small cluster of strong points, and inevitably it came down to the courage of the lone infantry man..and his luck. If the shelling had moved the nearby landscape so that some of the incoming gunfire was negated, if he could look above the rubbish of the battlefield to register this fact, if he could see a way forward through the slime, if he could make the perilous journey to the pillbox and still live, he could with luck put a grenade through the firing slot and stay alive. Many Victoria Crosses were won in the battle, nearly all of them for destroying strong-points. It rained heavily for the next four days. Fierce, bloody and indecisive fighting took place in the old No Mans Land during these fearful days. On the fifth day, the rain stopped but the weather left only sullen skies and intermittent rain. The mud grew deeper and wider. Haig instructed a Canadian attack against Hill 70 at Loos far to the south. The attack was successful, but it did not weaken the German position or manpower in the Salient. Fighting intensified for ever smaller positions both by attack and counterattack, and many woods and pillboxes were to the point of absolute extermination of the place in question and its garrison. It continued: by mid-August 3½ inches of rain had fallen. Men began to drown in the mud. They or their shattered remains are still entombed below the verdant farmland of the Salient; I have been present when their remains were excavated by the War Graves Staff. There are nearly 54,000 names of men on the Menin Gate and a further 34,000 listed at Tyne Cot; they have all disappeared here, somewhere, and have no known grave. The Germans suffered equally, and the Salient must be the biggest graveyard of unknown soldiers in the world. Haig asked Plumer to extend his lines to the north to break the ongoing deadlock on the Menin Road. This he did, but with the proviso that future operations would be against limited objectives on a "Bite and Hold" basis. Haig accepted. Plumer continued with his planning into September. By the end of August, Haig had lost over 68,000 men since 3:50am on the 31st of July, many of them drowned. Tanks were bogging in the ever deepening mud. He was going to have to make decision whether to continue the battle or not. The politicians in London were waiting. Parody and satire are two weapons in the soldier's arsenal that are designed to defend and protect him from the psychic wounds so easily incurred at the front. The Western Front produced the classic Wipers Times, and the Salonika Front had its Balkan News. The latter originally published in serial form "The Song of Tiadatha" by Maj. Owen Rutter (7th Wiltshires), his parody of Longfellow's "Song of Hiawatha" that traces the experiences of the hapless "tired Arthur" throughout the war. Some have learnt to write out orders. After the war Rutter became a well-known travel writer (link) and died in 1944. The verse is unpolished, but the strength of feeling takes precedence here and reaches out to a wide audience. The ordinary, long-suffering soldier, unglorified but held in common affection seems a particularly 20th-century literary figure. Consider The Good Soldier Schweik (Jaroslav Hasek), Joseph Heller's oddments in Catch 22, and our Salonika veteran, "Tiadatha". Excerpt -- Part XVII, "Home at Last," pp. 142-44 -- was published originally in September 1918. The full work, Song of Tiadatha by Major Owen Rutter, [New York]: Duffield & Company, MCMXXX, is hard to locate. 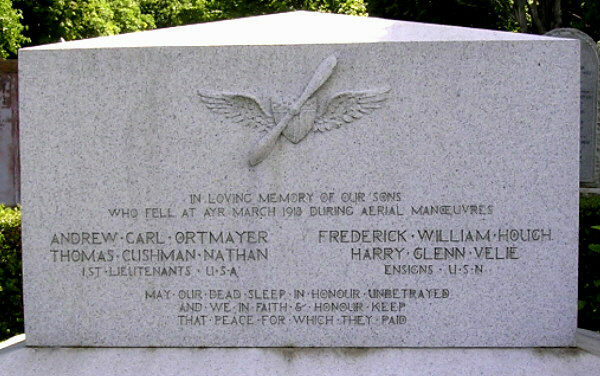 The photo below shows the monument and graves of four American airmen who are buried in Ayr Cemetery, Ayrshire Scotland. They were killed while training nearby. All came from Chicago except Lt. Nathan, who came from Boston. The memorial and the engravings are in immaculate condition, Alongside the memorial are the actual graves for each man, with a small flat tablet showing the dates of birth and death and his home state. 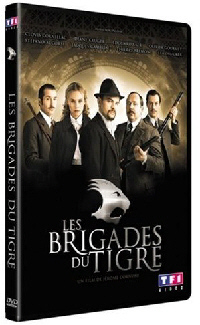 Set in "La Belle Époque", Les Brigades Du Tigre ("The Tiger Brigades") is based on a hit French TV series of the same name from the 1970s. Its evocative TV theme music by Big Band legend Claude Bolling brings back the same nostalgic thoughts to a Frenchman as the theme from Hawaii 5-0, Batman or The Twilight Zone does for us here in the States. This feature film version was directed by Jérôme Cornuau and was released in France in 2006. Les Brigades Du Tigre is based on fact. When Georges Clemenceau ("The Tiger") was Minister of the Interior in prewar France, he authorized the creation of the first "specialized" units of police, a kind of Gallic "Untouchables." These twelve units were equipped with the most modern technology police science had available at the time: the telegraph, the motor car, the typewriter, photographic analysis and identification through fingerprints and facial recognition composite drawings. This was very cool cutting-edge stuff in 1912, the year the movie takes place. There's a lot of real history and real people in Les Brigades Du Tigre: the scandal of the Russian Loans, Alphonse Bertillon and the beginning of modern police techniques, the deadly rivalry of the Parisian Prefecture and the Tiger Brigades, Jean Jaurès, the Socialist pacifist publisher, and the criminal anarchists who followed the philosophy of illegalism. The film has an all-star European cast with Clovis Comillac (Les Chevaliers Du Ciel/"Sky Fighters"), Edouard Baer, Gerard Jugnot(Les Choristes/"The Chorus"), Olivier Gourmet (L'enfant/"The Child"), Diane Kruger (Joyeux Noel/"Merry Christmas") and Stefano Accorsi (Le Fate Ignoranti/"His Secret Life"). Cormillac, Baer and Gourmet are the "A" Team, and Accorsi is the rookie trying to make good. Jugnot is their chief, Faivre. And Kruger is a Russian princess in league with the infamous Bonnot Gang. The Bonnot Gang did exist. Octave Garnier, Raymond Callemin and Rene Valet were its founders. Jules Bonnot was a criminal anarchist, although not the leader of the gang that bore his name. He joined the Paris-based gang in December 1911. The gang made headlines on December 21st, when they robbed a messenger of the Societé General Bank in broad daylight and made their getaway in a motor car. The gang was actually first called "The Auto Gang" because of its use of motor cars, which was Garnier's idea. This was the first motorized getaway. And it's the first action highlight in the film. Jules Bonnot was a publicity hound and contacted the newspapers, so he became well-known. 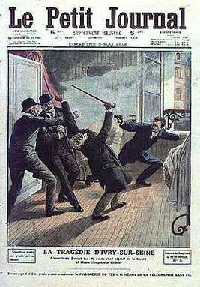 The gang eventually became known as "The Bonnot Gang" in the French press. The Sureté Chief Xavier Guichard took charge of pursuing the anarchist gang. (Guichard is the man Maigret reports to in the crime novels by Georges Simenon.) A massive crackdown and roundup of gang members took place after a bloody March 25, 1912 bank robbery. By the end of April 1912, Jules Bonnot, Octave Garnier and Rene Valet were still at large. Bonnot was on the run in April 1912 and on his own. He survived a shootout with the police, killing the vice-chief of the French Police and wounding another policeman. He was tracked down to a house in the Paris suburb of Choisy-le-Roi were he held off 500 armed men from the police, army, fire department, etc. During the siege he was finally nearly shot to pieces and eventually dynamited into submission. All of this is depicted in the movie. However, the movie throws in a connection of Jules Bonnot with the Russian princess and the scandal of the prewar Russian Loan bubble. The plot gets complicated in this period thriller. You've got police rivalry, corrupt civil servants, anarchists and the Russian princess who's staging Ivan the Terrible at the Paris Opera! The action-packed finale takes place at the opera with death and destruction for a number of cast members. Now, even my niece who is fluent in French had trouble following all the plot twists and characters. However, I enjoyed it thoroughly! I was able to find a bare-bones DVD release at www.xploitedcinema.com to review. I liked this movie so much, that after watching it once, I ordered the deluxe 2 DVD set at www.amazon.fr. Guess I want those 2½ hours of extra features! The following are thanked for their contributions to this issue of the Trip-Wire: Tom Jones, David Homsher, Susan Neeson, Fred Castier, Tony Langley, August Blume, Sidney Clark, Christina Holstein, Tony Noyes, Andy Melomet, Kimball Worcester, and Len Shurtleff. The World War I Document Archive helped with both our Literary and 90th Anniversary features. The William Seegers article was found at Wikipedia. Until next month, your editor, Mike Hanlon.